“Stu’s mother was my Dad’s stepfather’s sister. That’s the connection. Stu learnt to fly in a Piper Archer with Wimmera Aero Club in the late 70’s, probably because of his Mum, Claire. She was a WAF, in the Womens Auxiliary Forces in World War II, based in Sale, Victoria. Stu’s first aeroplane was a Volksplane VP1, VH-TKA. Tom Kennedy built it! My Dad used to nail boxes together at SAFCOL and Tom was his boss. Stu always wanted to stand up and salute while he was flying in it! Before the VP though, Stu had an accident while riding his motorbike. He was hit from behind by a car in Portland and was badly injured. He lost his sight in one eye when his glasses smashed back into his eye. After some time, he bought another aeroplane after the VP1, also a crayboat and a licence. He sold that and then he went on to buy a Victa Air Tourer VH-BWG. 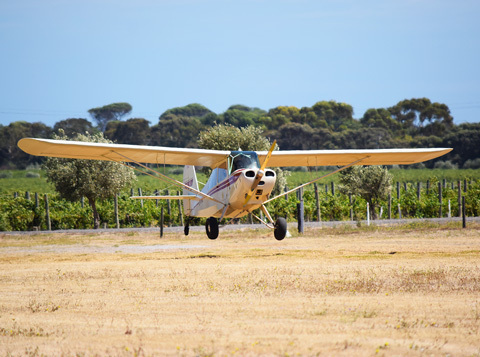 The South Australian Aero Club had it for years. He sold that and it was made into a demonstrator for Victa. He worked as the Portland Airport Manager and also collected the weather. He was still single, always happy and extroverted, particularly maybe because of his facial injuries! Now in the 1990’s, and in his 30’s, he started collecting aeroplanes and motorbikes with sidecars. The aeroplanes were Aeronca’s, one of which became VH-STU, after he bought the registration. She became a long standing love of his. 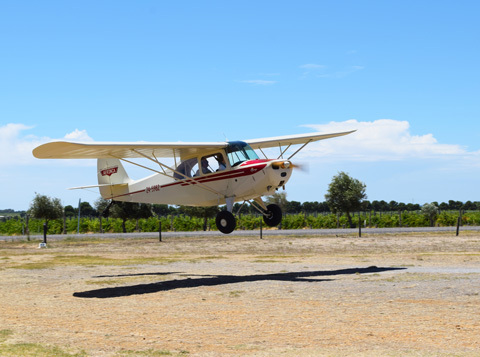 She was hangared at Cashmore Air Strip and he flew her just for fun. In the mid 1990’s he married Therese and they had 3 children Claire, Willem and Toby. 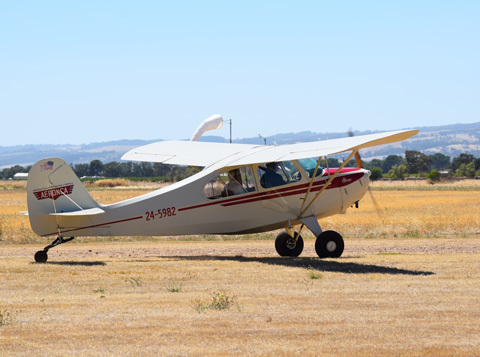 During this time, he sold the other Aeronca, VH-UMP which went to Yorke Peninsula, and kept his beloved Aeronca STU. Stu absolutely loved open cockpit flying and had a real affinity for it! Stu would love to fly along the coast to the Bung Bung Air Strip. I would fly to meet him there in the Leopard Moth and maybe Dad would sometimes fly in the Tiger Moth. He would land and there was an old plough disc that he kept in the pine trees. He would pull it out and we’d barbeque a breakfast of bacon and eggs for everyone. He came to work for me in maybe 2008, and began his Adult Engineering Apprenticeship. He was exceptional with regards to research, logbooks were immaculate in his beautiful handwriting, and he was an incredible mathematician! He attended Trade School at Mormel, Latrobe Valley. But a couple of years later, he began to have some mood swings, memory recall and maybe occasional balance issues. When he came down to the workshop to see us, he often joked with the boys saying that at least he hadn’t lost his sense of tumour! Harvey began the restoration of VH-STU on the 14th May 2015. They bought a whole new nose cowl from America and it didn’t fit! This one has a hinged cowl and in the end they built a new one themselves! The windscreen is original. The Instrument Panel has all new instruments, it never had an electrical system, so that is a new addition. Sat at my table, I can remember his wicked laugh and his face crinkling up!